I was a co-presenter last night for Technology Skills for Writers at the Golden Ears Writers. I presented Microsoft Word for Writers and was reminded again at how well Microsoft has hidden some of its most useful features. One of the most essential features of Word is Styles. It has been there since the beginning of Word, I used with with Word 95 but until they introduced the Ribbon toolbar it has been a hidden gem. What the hay is a style? A style is a group of formatting characteristics such as font, colour, and spacing that you apply to the text in your document at one time. What does that mean? It means that if you use styles you can change the look of your document with just a few clicks. This saves you a lot of time when you are working on large documents and ensures a consistent and professional look to your whole document. Learn styles and you will no longer waste hours manually going through your document and selecting text and trying to remember if you used 12pt Arial or 11pt Verdana on the last page. It means that with some time invested up front you can indent paragraphs, add space between paragraphs, double-space, add text and numbering to your headings (Chapter 1), and more with the click your mouse. You can use and edit styles from the Ribbon. On the Home tab, in the Styles group, right-click on the style and select Modify. Or you can do it old-school (this is my preference). 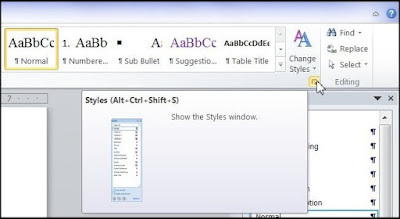 On the Home tab, in the Styles group, click the Styles Dialog Box Launcher or use the shortcut keys (Alt+Ctrl+Shift+S). The Style Pane will open. 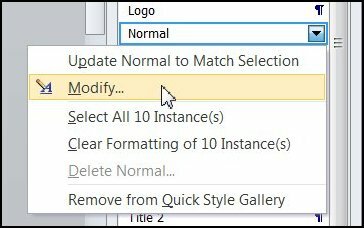 Select a style and click on the drop-down button, select Modify. If you like the dialogue in your book to be indented on both the right and left and in italics, create a style for dialogue. From the bottom of Style Pane click on the New Style button. Learn more about styles on the Microsoft site.